La fabbrica illuminata was conceived as a new form of ‘virtual sonic theatre’ that would expose the ‘lives in danger of fetishisation by technology’. Composed in 1964 for voice and 4-channel surround sound, Nono entwines the noise of factory plants and workers’ voices with pre-recorded and live soprano. Mastered for headphone listening in surround-sound binaural format. In his 1962 essay ‘Possibilità e necessità di un nuovo teatro musicale’, Nono argued that ‘New human situations urgently demand expression. Especially if our lives are in danger of being fetishised by an exaltation of technology’. He conceived La fabbrica illuminata as the first instance of this new ‘virtual sonic theatre’. It derived from a large-scale music theatre project about the conditions of factory workers entitled Diario italiano, which Nono worked on with the writer Giuliano Scabia. La fabbrica illuminata became a standalone piece in 1964, when Nono offered it to the Prix Italia, who had invited him to present something at their concert in Genoa. While the work fulfilled the Prix Italia’s stated aim to encourage new radiophonic art, the concert organisers RAI (Radiotelevisione Italiana) rejected it because of its political content. The premiere instead took place later that year, at the 27th Venice Biennale. Nono had visited the Italsider factory plants, processing steel and iron, near Genoa, taping noises and workers’ voices which were entwined with parts for pre-recorded and live soprano (originally sung by Carla Henius). Individual phonemes were exaggerated and distorted to emphasise human feelings, with sound ‘effects’ contextualising the events being narrated. In its original performance set-up the four tracks were assigned to four loudspeakers (or groups of speakers) at corners of the room, and the soprano performed unamplified. The superimposition of live voice over recorded parts requires some delicate balancing. Although the score specifies dynamics — and dynamic peaks are extremely important — it allows for interpretation according to the size of the venue, voice strength, and the type of loudspeakers. Nono was concerned with making the listener feel as if they are inside the sound but also wanted to confuse them so that they are unsure where the sounds are coming from. Listening to this new binaural version on headphones recreates and in many ways intensifies the experience of listening from within the four-channel set-up, with sounds moving around the sonic environment to approach from afar, overwhelm with noise, and dwindle to nothing. For Nono, music’s goal and necessity is always ‘communicating’, and at the heart of La fabbrica illuminata is a desire to expose worker conditions. The solo soprano is left alone at the end, singing four verses by Cesare Pavese that suggest some hope: ‘Morning will pass, concerns will pass, it will not always be like this, you will find something again’. Whether or not the political message of La fabbrica illuminata resonates today, in a still-more post-industrial world, the power of its musical soundscape — from the roar of melting metal to the fragility of a lone singing voice — is retained. 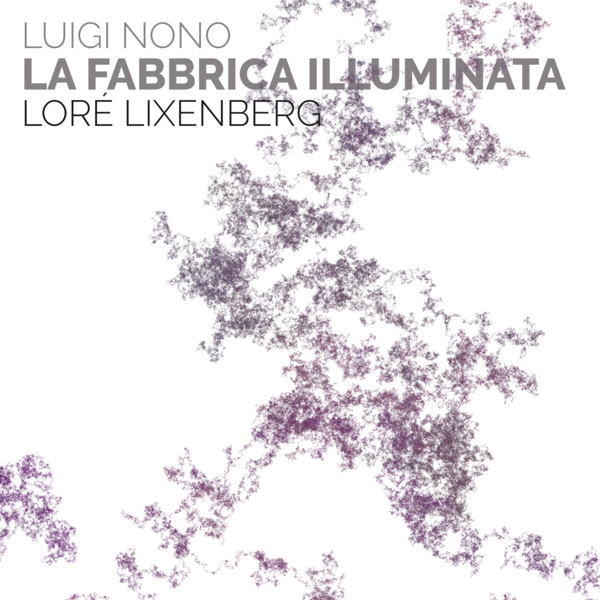 I’ve always felt that La fabbrica illuminata encapsulates the very core of Nono’s compositional inspirations, combined with his personal ideals, deep political convictions and a very keenly heard sense of space. It is also a wonderful example of a piece emerging from the symbiotic creative relationship between interpreter and composer. Carla Henius with Luigi Nono, Michiko Hirayama with Giacinto Scelsi, Cathy Berberian with Bruno Maderna and Sylvano Bussotti: all these singers had a huge impact on the vocal music of the composers they collaborated with. One of the biggest challenges of performing La fabbrica illuminata is how to inhabit the space when you are not actually singing. Nono requires the solo singer to be silent for many sections, perhaps as a witness to the horrors the recorded workers voices recount, and perhaps also playing the role of a kind of twentieth-century Beatrice, using her voice to lead the listener to the seventh circle of hell, to witness the ‘lives in danger of fetishisation by technology’, whilst herself standing outside it. It seems to me that, in La fabbrica illuminata, Nono closes the circle opened by that other famous Italian, the artist/sound poet Filippo Tommaso Marinetti. In the naiveté of pre-WW1 Italy, Futurism joyfully employed the voice to recreate and celebrate the sounds of technical progress; with Nono, post-WW2, the voice lets forth a human cry of protest against the dehumanising results of that very progress.